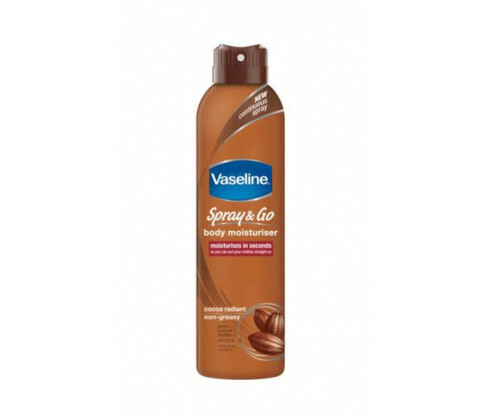 Vaseline Aerosol Moisturiser E Spray And Go is a non-greasy, non-sticky formulation that moisturizes your skin in seconds. It contains rich cocoa butter and other active ingredients that leave your skin instantly soft, smooth and glowing all over. The moisturizers dispenses evenly all over so that you are dress up immediately. Always read all instructions and product details carefully before use. Do not use in case you are allergic to any of the ingredients. The moisturizer is for external use and topical application only. Do not allow the spray to enter your eyes or mouth. Store the container in a cool and dry place away from the reach of children. This spray-on moisturizer is just perfect when you are short of time. To use, hold the container at a distance of four inches from your body and spray all over in one continuous motion. Rub in quickly and you are ready to go. 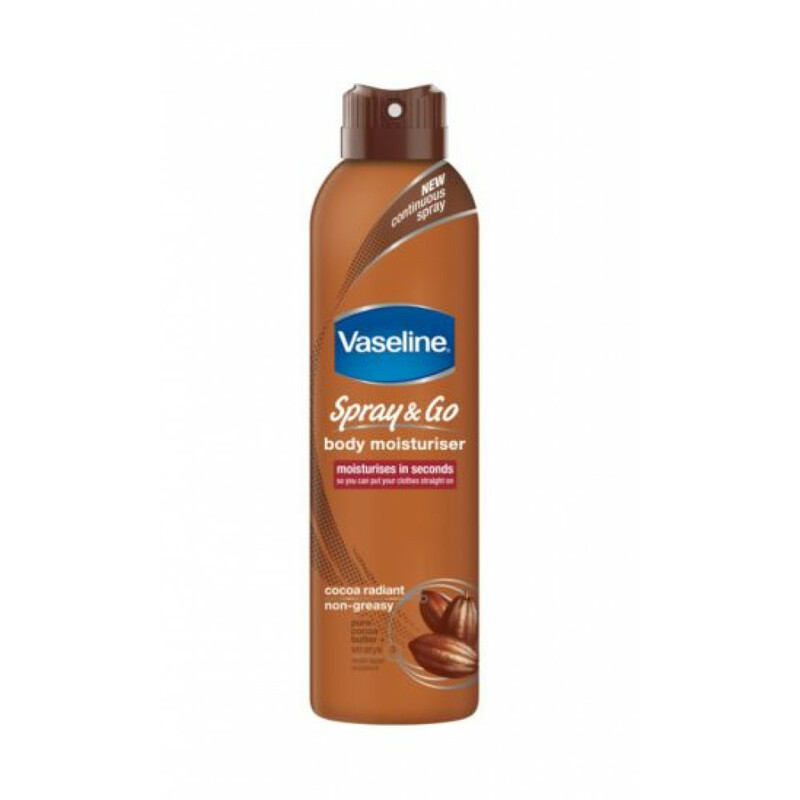 Vaseline Aerosol Moisturiser E Spray And Go contains Aqua, Glycerine, Isopropyl Myristate, Sorbitan Isostearate, Dimethicone, Tapioca Starch, Theobroma Cacao (Cocoa) Seed Butter, Polyglyceryl-3, Dihydroxypropyltrimonium Chloride, Stearic Acid, Diisostearate, Carbomer, Sodium Hydroxide, Ammonium Acryloyldimethyltaurate/VP Copolymer, Xanthan Gum, Pentasodium Pentetate, Disodium EDTA, Phenoxyethanol, Parfum, Propylparaben, Methylparaben, Benzyl Benzoate, Benzyl Alcohol, Hydroxyisohexyl 3-Cyclohexene Carboxaldehyde, Coumarin and Limonene.